During the 1950s we gathered for Remembrance Day - as now - on the nearest Sunday to November 11th - always a strange and sad affair during my childhood, commemorating as it did those whose lives I had missed, but whose relatives I knew. The war veterans of the British Legion from our village and from Baginton turned up self-consciously in their best suits, medals clanking. You could sense their nervousness as they formed the head of the procession up the aisle, the shaking, white-gloved hands of the flag bearers laying their banners by the altar. Each year the dead from our parish lived briefly once again as their names were read from the marble plaque; the wind-up gramophone in the Baptistry at the back of the church wheezed out Reveille and the Last Post. Then the two minutes' silence, heads bowed - sparrows chattering by the porch. Now, a century on from 1914, only the Elliott family remains in Bubbenhall of those named on that plaque. Who were they, these men who sacrificed their lives far from home, and what of their families left behind in a village of some 225 people? Only 40% of British Service Records are still intact, many having been destroyed in World War II, but detailed documentation does exist for two Bubbenhall men, one being Harry Elliott. He, it seems, joined up on 8th September, 1914, during the peak period of recruitment when news of the British retreat following the Battle of Mons reached Britain. He even falsified his age by two years to get in. 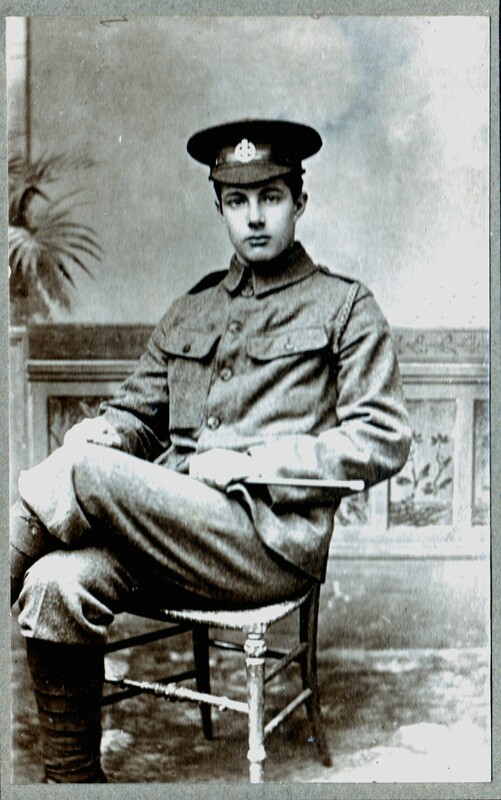 His younger brother, however, born in 1900, was recruited towards the end of the War, when a shortage of sufficiently healthy young men at this stage meant that the British government overturned their promise that no one under 19 years of age would be sent overseas to fight. In April 1918 they lowered the age to 18 after suffering a near-defeat on the Western Front. Of the eight who died across the Channel, two fell in Belgian Flanders in 1916 and 1917, in the area known as the Ypres Salient (a salient is a battlefield feature that projects into enemy territory), where five battles took place between 1914 and 1918; four fell on the Somme between 1916 and 1918; and two fell in the Cambrai-Arras area in Picardy in 1918. Both Samuel Fellows and Howard Drinkwater joined the Machine Gun Corps, formed in October 1915, having earlier been members of the Royal Warwickshire Regiment and the Warwickshire Yeomanry respectively, suggesting that they joined up before the autumn of 1915. The cemeteries where the men are commemorated, or in three cases actually buried in a known grave, vary from the huge memorials dividing up the dead of the Ypres Salient and the Somme according to when they were killed, to communal cemetery extensions of local French cemeteries such as Noyelles-sur-l'Escaut. Three of the men, Samuel Fellows, Fred Vincent, and Howard Drinkwater, came from parishes other than Bubbenhall - two from the Coventry area and one from Willoughby near Rugby. Fred Vincent is also remembered on the War Memorial at Walsgrave-on-Sowe and the Roll of Honour at Bablake School, Coventry, whilst Howard Drinkwater is remembered in a memorial window in St. Nicholas Church, Willoughby. Our own memorial in Bubbenhall Church might well have included a tenth man, Sidney William Dowell from Bubbenhall, who is commemorated on the family grave on the north side of the churchyard and also on the War Memorial in Church Street, Warwick, since he had married a Warwick girl. It was in May 1916 that conscription was extended to married men, and this may well have been when Sidney William Dowell was called up. Just one man, Walter Robert Mills, was brought home and buried in Bubbenhall churchyard, also on the north side. A detailed record exists for him - the last of the Bubbenhall men to die as a result of the War. We know therefore that he was posted to Salonika in Greece, sent home seriously wounded to Winchester in March 1918, and died of pneumonia in a military hospital there almost a year later, a few months after the Armistice. Of those at home in Bubbenhall, John Waring left an invalid father. By the end of the War John Darlow's family in Bubbenhall was reduced to a widowed mother and a daughter who never married. In the Elliott household the two younger of three sons were now dead, and their parents, devastated, struggled on for the sake of their surviving boy, Bill. 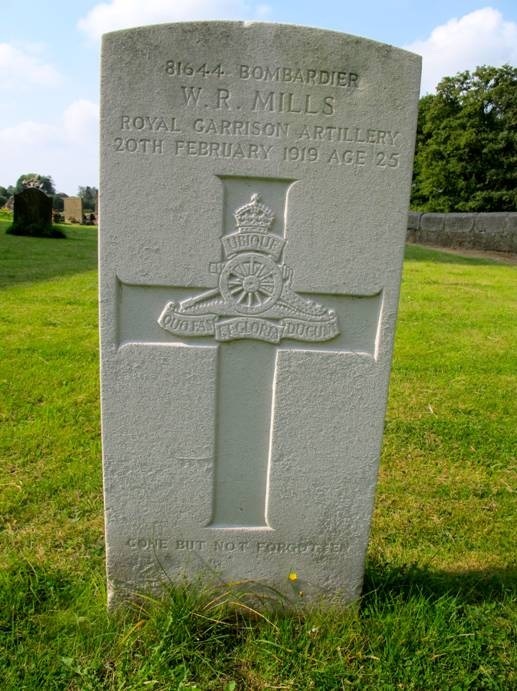 The two youngest boys in the large Mills family had been killed, but at least the War Graves Commission had provided one of them with a grave that could be visited and tended at home in the village. John Waring 1st Royal Warwicks killed in action Thursday, July 26th 1916. According to the Census Schedule of 1911 John was born in 1889 in Exhall and worked as a roadman. He lived with his father, James Waring, from Ryton, 68 years old the year his son was killed, an invalid and former roadman with Warwick R.D.C., and stepmother, Hannah Waring from Keresley. A relative of the Warings, Kenneth George Athersuch, was killed in action in World War II, in February 1945. Charles John Darlow 16th Royal Warwicks killed in action Sunday, September 3rd, 1916. The 16th Royal Warwicks were the 3rd Battalion of the Birmingham Pals. According to the Census Schedule of 1911 Charles John was born in 1886 in Bubbenhall and worked as a gardener. He lived at Mount Pleasant, the cottage, now a house, behind Hill Cottage, on the Stoneleigh Road, with his widowed mother, Jane Darlow from Coventry, 59 years old the year her son was killed, and two unmarried sisters - Laura , school caretaker, and Sarah, who died in 1917. His other sister, Elizabeth, had married in 1912. After the death of their mother in 1925, Laura lived alone at Mount Pleasant. Harry John Elliott 10th Rifle Brigade killed in action Monday, February 12th, 1917. His British Service Records state that he is a baker, and has joined up at the age of 19 years, 2 months (see below), on 8th September, 1914 (Britain declared war on Germany on August 4th, 1914. He was posted the next day and embarked at Folkestone on 21st July, 1915 for France with his battalion. "Killed in action 12.2.17 'place withheld'." Harry was born in 1897 in Bubbenhall (N.B. not 1895: he clearly falsified his age by two years in order to be accepted for the army in 1914). See also below, Percy George Elliott. Samuel Fellows 2nd/5th Bn. Royal Warwickshire Regiment killed in action September 6th, 1917. Son of the late Sharrett and Margaret Fellows. Commemorates those in the Ypres Salient who died after 16th August, 1917 - almost 35,000 whose graves are unknown. On the Bubbenhall memorial plaque Samuel Fellows is described as belonging to the Machine Gun Corps. 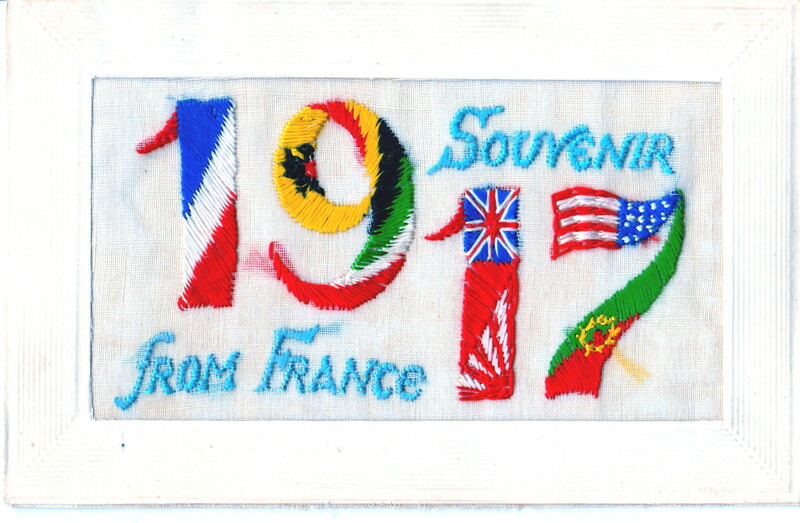 This was formed from earlier regimental units in October 1915. According to the 1901 Census Schedule Samuel, born in 1895 and his sister, Esther, both from Coventry, lived at Court 1, Queen Victoria Road, Coventry. His father, Sharrett Fellows from Birmingham, was a cycle fitter. His mother, Margaret, came from Walsall. According to the 1911 Census Schedule Sharrett Fellows was remarried, to Mary Jane Fellows, from Birmingham, described as a pen grinder, and they lived at 12, Hatchett Street, Birmingham. The younger children, Esther, and Lily, were now boarders in the household of Emma Smith in Bubbenhall, a widow from Coventry and a foster worker. Samuel Fellows, who was visiting them on the night of the Census, was described as a butcher worker. Frederick Charles Vincent D.C.M. K.R.R.C. killed in action Thursday, March 21st, 1918. March/April 1918 was a period of dire crisis, when the Fifth Allied Army was driven back by overwhelming numbers across the former Somme battlefields. Over 14,000 UK casualties are commemorated here with no known graves, and died on the Somme March 21st-7th August, 1918. When he left for the War he was employed at the Daimler Co. Ltd. He is commemorated as Fred Vincent on Walsgrave War Memorial His name is also on the Bablake School Memorial Roll in Coventry. According to the Census Schedule of 1911 Fred Vincent was born in 1894 in Foleshill and worked as a draughtsman. His father, William Charles Vincent from Kenilworth, was a motor mechanic and his mother, Emily, came from Sandon, Staffs. He had two younger sisters, and a younger brother, Sidney James, born in 1908. According to the website on the Standard Motor Company, Fred's father worked for them for a time. They supplied all the cars for the Delhi Durbar in India in 1911, and also, apparently, the drivers. William Charles Vincent was chauffeur to George V during the visit, and afterwards the king presented him with a number of gifts, including a ceremonial kukri set carved to depict the king on a tiger shoot, plus a set of gold cufflinks from Garrards. W.C. Vincent left the Standard Motor Company and ran the Three Horse Shoes in Bubbenhall from c. 1913. Percy George Elliott Ist Royal Fusiliers, killed in action August 8th, 1918. August 8th was the first day of the Battle of Amiens. This cemetery includes graves from battlefields and small burial fields on all sides of it. Percy was born in 1900 in Bubbenhall. He lived with his father, Henry Elliott, a gardener, mother Annie from Pailton, and two brothers, William (Bill), a horseman on a local farm, and Harry, who was a baker. They lived in the old timber-framed cottage, "Buff Rest" - now rebuilt as Ashgrove. Percy was only 14 years old when the War started and his brother Harry enlisted. He himself was possibly conscripted as late on as April 1918, and died only four months later. His gravestone gives Friday, 9th August as the date of his death. Bubbenhall War Memorial reads 8th August. He was 18 years old. Henry and Annie were devastated by the death of Harry and then his young brother, Percy, a year later, but realized they had to go on living for the sake of their remaining son, Bill. Annie died in 1949 and Henry in 1950. Bill and his wife and family continued in the same cottage. After Bill's death in 1970, when the place was empty and the roof caught fire around 1972, there were still a number of cards from the Front in France and photographs of the boys in uniform among the debris. Arthur James Mills 8th West Yorks, killed in action Friday, September 27th, 1918. Sometimes, where military or medical units were based near to a village behind the Front Lines, military burials were made in the local village civilian cemetery, or "communal cemetery". Often the number of burials had to continue outside the civilian cemetery boundary, and formed a "communal cemetery extension". Over 100 1914-18 war casualties are commemorated at Noyelles-sur-l'Escaut, between Cambrai and Bapaume. Presumably the West Yorks Regiment, part of the 62nd (2nd West Riding) Division serving in France 1917-18, was on its way to reoccupy Noyelles in conjunction with the Battle of Cambrai, October 8th-10th, 1918. It had previously been captured and evacuated in Nov-Dec 1917. According to the Census Schedule of 1911 Arthur James was born in 1898 in Bubbenhall and worked as a farm labourer. He lived with his widowed mother, Mary Ann from London, who was then existing on private means. He had four brothers, all farm labourers, born between 1885 and 1895, and a sister, Annie Elizabeth, who worked as a domestic servant. The Mills lived in the old timber-framed cottages opposite the Spring, next to the Reading Room. These cottages were later condemned as unfit for human habitation and pulled down in the Fifties. Other members of the family lived at the Moat, part of the old Home Farm - where Moat Close is now. It was the two youngest boys in the family, as with the Elliotts, who were killed in the War. Howard Douglas Drinkwater, 1st Warwickshire Yeomanry, killed in action Sunday, September 29th, 1918. This memorial bears the names of over 9,000 men who fell in the period 8th August, 1918 to the date of the Armistice, in the Advance to Victory in Picardy and Artois, between the Somme and Loos, and who have no known grave. The Hundred Days Offensive - the final period of World War 1, began with the Battles of the Hindenburg Line. The Meuse-Argonne Offensive - the Allied Offensive along the entire Western Front, was fought September 26th-November 11th , 1918. The 100th Bn . Machine Gun Corps, to which the French war memorial ascribes him, was involved in the first phase, Sept 26th-Oct 3rd, in what was mainly an American attack. There is a memorial window in the church at Willoughby, installed in 1919 by the village at a cost of £100, dedicated to the memory of Howard Drinkwater and William Hakesley. According to the 1901 Census Schedule Howard Drinkwater was born in 1896 in Willoughby, near Grandborough, Rugby, and lived with his widowed father, Alfred, a gardener, his aunt, Lois, and brother, Reginald, born in 1895. According to the 1911 Census Schedule Alfred was remarried, to Emily Drinkwater from Priors Marston, and there was now a small stepsister and stepbrother. Howard was living at home and described as a farm labourer, but was clearly living in Bubbenhall at the time he joined up for the War. Walter Robert Mills R.C.A. died in hospital Thursday, February 20th, 1919. His British Army Service Records state that he joined up in 1916, when he was 21 yrs, 3 mths. old. Certified by approving officer 22nd May, 1916, Citadel, Plymouth, No. 8 Depot, Royal Garrison Artillery. According to these records Walter Robert Mills was 5 foot 11 inches tall. His service record shows that he was initially with the Home Brigade from 11th December, 1915-10th December, 1916. He then served in Salonika, in Greece, 11th December 1916-7th March, 1918, after which he was sent home - a voyage of eight days in March, 1918. He was then described as being in the Home Brigade from 27th March, 1918-20th February, 1918, and there is a note saying: "Not to be sent any theatre of war other than France/Italy." His war service is totalled as 3 years, 71 days. He died from pneumonia on 20th February, 1919 at Magdalen Hospital, Avington Park Camp, Winchester, the practice being that the seriously wounded were taken back to Britain by Hospital Ship and then on to the relevant hospital for further treatment. There were several camps and military hospital facilities at Winchester. Anglo-French forces had begun landing at the Greek port of Salonika (now Thessalonika) on 5th October, 1915. They were to provide assistance to the Serbs who had recently been attacked by the combined German, Austro-Hungarian and Bulgarian armies. The surrender of Bulgaria took place on 30th September, 1918, six months after Bombardier Mills was sent back to Britain. According to the Census Schedule of 1911 Walter Robert was born in 1895 in Bubbenhall and worked as a farm labourer. See also above, Arthur James Mills. 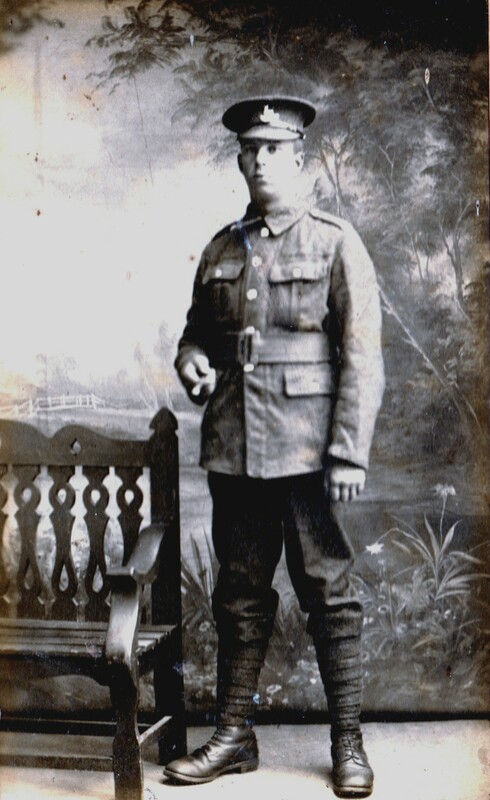 Sidney Willliam Dowell, Royal Warwickshire Regiment, died on November 18th, 1916. Age 28. Grandcourt Road Cemetery, Grandcourt, Somme, France. Grave ref. B 32. 11 men from the same regiment are buried there. Some of the British and Commonwealth cemeteries contain a small number of battlefield burials for the graves of soldiers buried close to where they fell in action. At Grandcourt Road there are 391 burials and commemorations. The cemetery was made in the spring of 1917, when the Ancre battlefield was cleared. The Battle of the Somme, 1st July-18th November, 1916, took place on both sides of the R.Somme. More than a million were wounded or killed. The Battle of the Ancre 13th-18th November, was the final large British attack of the Battle of the Somme in 1916, before winter. According to the Census Schedule of 1901 Sidney was born in 1889 in Bubbenhall and lived with his widowed mother, Eliza, who was then existing on her own means, and brother, Herbert John, born in 1886 and working as a farm labourer. By the time of the Census Schedule of 1911 Eliza was working as a laundress in Bubbenhall. Sidney was working in Coventry as a silk spinner, was married to Harriet, née Ash in 1910, and they had a daughter, Edith, b. 1911. They lived at 55, Oliver Street, Coventry. His wife and child were apparently living in Warwick with her mother, Mrs. Ash, at 26, Bridge End when Sidney was at the Front, and thus his name appears on the Warwick War Memorial. However, he is named on the family grave inscription in Bubbenhall churchyard, together with his mother, Eliza, who died on 1st March, 1943, and his brother Herbert John (Bert), who died on 19th March, 1953. In May 1916 conscription was extended to married men, and this may have been when Sidney William Dowell, seemingly the only married man of the ten who were killed, was called up. He died on the very last day of the Battle of the Ancre that same year. 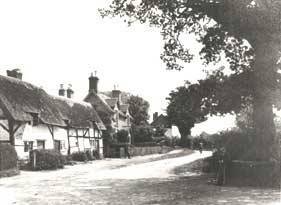 The Dowells lived in the end cottage of the former Rectory cottages where Gill Green now lives.